Two NATO member states have recently acquired the Rippel Effect Systems multi-shot handheld XRGL40 extended range grenade launcher. This was confirmed by Dawid Fourie, Rippel Effect marketing executive, during the recent Eurosatory exhibition in France. The ability to fire less-lethal grenades makes the XRGL40 ideal for Special Forces, peacekeepers and law enforcement agencies who have a requirement to scale operations, Rippel said. 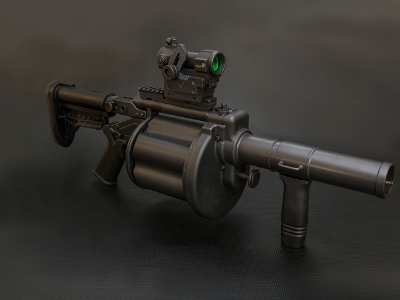 But to fire less-lethal grenades in semi-automatic mode from a multi-shot grenade launcher, Rippel Effect had to find a solution to the technical problem of sufficient gas pressure that normally rotates the cylinder. “The XRGL40 functions with our proprietary variable port pressure device (VPPD) that enables the cylinder to advance to the next round as quickly as the operator pulls the trigger, even when firing very low pressure less-lethal grenades. “This weapon is already operational in more than a dozen countries around the world, having been selected for its ability to function as a multi-role weapon, but we can now proudly add NATO members as users for this reason,” said Fourie. It was reported last year that Energetics Technologies Limited (ETL) of the UK had become the latest ammunition manufacturer to use Rippel Effect’s XRGL40 launcher to develop a 40 mm medium velocity (MV) grenade. Other ammunition developers that used the XRGL40 were Diehl BGT Defence, Rheinmetall-Denel Munition and Indumil of Colombia, while STK of Singapore and Atlantis Corporation of South Africa both now certify their extended range low velocity grenades with the XRGL40. The company has now also entered production of its six-shot RLL37/38 and RLL40 dedicated less-lethal launcher, developed on basis of the success of the XRGL40 launcher for the military.